OpenSimulator is a 3D Application Server. 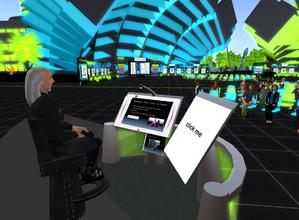 It can be used to create a virtual world which can be accessed through a variety of clients, on multiple protocols. OpenSimulator allows you to develop your world using the technologies you feel work best - we've designed the software to be easily extendable through loadable modules to build completely custom environments. OpenSimulator is released under a BSD License, making it both open source, and commercially friendly to embed in products. Out of the box, OpenSimulator can be used to simulate a virtual world similar to Second Life™ (including client compatibility), however can be extended with modules to support MXP or realXtend clients too. For a list of availible third party modules, check our forge site. Or you could run a simple standalone OpenSim on your Windows desktop to create and preview content. Here is an tutorial showing how to get opensimulator in stand-alone mode..